As investors, it’s easy to focus on trying to find the best investment, find the lowest fee fund, or how well your portfolio did compare to the S&P 500. It’s easy because you can “feel” those things. While these are easy to focus on, a growing body of research shows that the focus should actually be on other things, things that are intangible. Vanguard has published a lot of research around financial advice and specially around what the value of a good financial advisor can add to an investor’s financial life. They conclude that effective advisors may add about 3 percentage points of value in net portfolio returns over time. 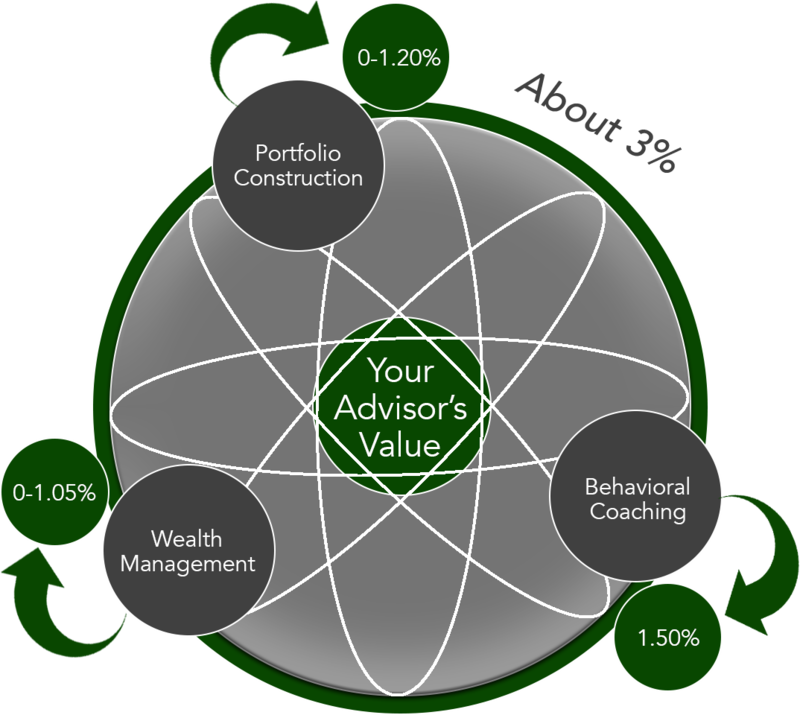 The biggest potential value-add of an advisor, in Vanguard’s perspective, comes in the form of behavioral coaching. This type of advice is not “what’s going to do the best over the next 3 months” but instead trying to help investors fight their own biases and think about more than just their investments. To put a little more context behind how we believe, and have seen, our advice can have a positive impact, beyond potentially increasing investment returns, let me share three areas we focus on: freeing up time; bringing clarity to your financial goals and life; and keeping your focus on what you can control (savings, taxes, …) and not what you can’t (market performance). Time: A great advisor can help alleviate you from the day-to-day burden of managing your finances, freeing up previous time and energy for other, more personally-fulfilling pursuits. How much will I need to achieve each of my financial goals? While these intangible things are harder to focus on, we believe, and the evidence shows, this type of advice and having an advisor that focuses on it, is more important and impactful on your long-term financial well-being. If you’d like to hear more and learn how we work, we’d love to connect. Contact us today for an introductory meeting.